Well today was a total failure! Yep, I sucked at weight loss today and everything health and fitness related. So I skipped out on my workout and I felt incredibly guilty. It was worse when I realized that I was not going to get in another workout today. I usually get in an afternoon on Monday bootcamp but tonight I had to go to ballgames so i missed all my workouts!!!! That's right, 0 workouts today. It wouldn't be so bad but I also ate terrible today. Why oh why did I screw up my diet and exercise in one day! I should have made better food decisions. But now the day is done. I made awful decisions today but tomorrow starts a whole new day. Now I just have to get my motivation back on track...no more screw up days for a while! I have to be diligent if I want to hit my next weight loss goal and get my Crossfit!!!! So now I have to sleep so I don't sleep in again! 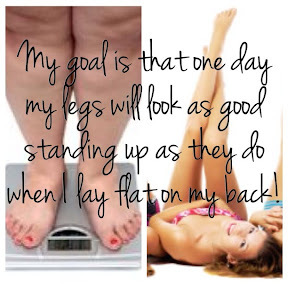 Big goals but I think it can be done! Lets have a good week starting now! Life gets in the way for all of us.......I missed boot camp too, I am home sick. We just have to push ourself to get back on track the next day.